Cable was exactly what I needed and work great. This is always true of cables I buy from PCH Cables. Service was great and Pat and staff were friendly and helpful as always. I also purchased a 10-foot cable, which I installed. The 10-foot worked flawlessly, which is expected of products from PCH. This one will serve as a spare...a habit I have. 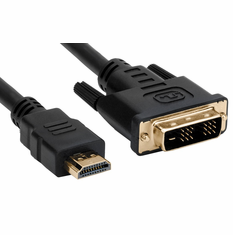 Purchased this cable to connect a second monitor to my PC. Worked first try and for the price I paid, it was excellent. Shipping to my door was earlier than quoted. Very much a A+ I will suggest PCH Cables to everyone I know...and some that I don't!! Cable is perfect for bringing my larger LCD online next to my laptop. The signal is cleaner and color is better than using the VGA out from the laptop. I purchased this to connect my new laptop with an older monitor that lacked an HDMI port but had DVI. It works perfectly. Very good value and beats buying a new monitor or using a VGA cable. My order was shipped fast and the cable was a very nice product. I tell all my friends to shop from here and not spend 3 or 4 times as much at Best Buy. ProsNice product and fast shipping. And in the good way, cheap cheap cheap! Cons3' was sufficient, but I'd have opted for a longer one if available, to give me future options for my set-up. Excellent quality, does what it's supposed to, just the right length. Works great connected between my client's 23" LCD monitor, (DVI) and his Sony Vaio, (HDMI). Just the right length, and pricing can't be beat. What's to say, the cable seems well built, works very well, and is priced at about half of what any other outfit sells these for.